Review: "The simple and convenient user interface of Masker allows you to use any existing file as the «container»; the container would remain fully functional (music would be listenable, movies — viewable, and so on); but the container will now have some additional baggage inside. Any amount of data (even folders with numerous subfolders) can be hidden. Moreover, the hidden data can be encrypted with strong algorithm and compressed. The extraction of the data is just as easy as hiding it. You can even preview the hidden files without «unhiding» them first — but nobody can do this without Masker and your passwords. Extreme reliability." You can transfer the carrier file through the internet and the hidden files inside will be transfered simultaneously with the carrier file, because they are the part of the carrier file. 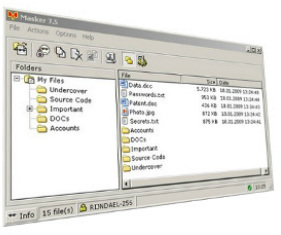 Use Masker to keep you sensitive secret files secure hidden and super-protected! Copyright © 2000 - 2014 Evgeny Zaretskiy (SoftPuls.com). All Rights Reserved.